Did you know you can now order your Deliveroo takeaway from Franco Manca here on View? 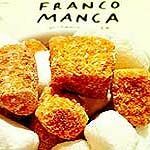 Do you work at Franco Manca? What did you think of Franco Manca? Pizzas here are good and our waiter was well friendly if a little OTT, will be returning! Best pizza in town. Friendly service, that their always packed is a testament not to good publicity but to amazing food. A few choices but the specials are always simply done, mouth-watering masterpieces. It's a yes from me. Best pizza in London. The setting itself is not particularly exciting but I guess some might find it ''atmospheric''. The choice is limited and pizzas are quite simple but everything they serve is of top quality. The service is very friendly and quick although you might still wait a bit as it gets pretty busy on weekends. And don't forget to try the organic lemonades they make! they also have some of the best-looking waitresses serving tables in London! My favorite is the little one with the dark hair, but the tall blond one is also sweet. Fantastic little restaurant with great pizzas and even better atmosphere. It's so popular that we had to queue for about fifteen minutes to get in on a Saturday, but the short wait is well worth it. The Italian waiters are friendly and funny, and it brings a real feel of Napoli to Brixton. We had two pizzas, lemonades, a bottle of wine, and espressos to finish, and even with a tip we still left with change from £25 which is pretty stunning anywhere, let alone London. Highly recommended, we'll definitely be going back. Franco Manca does the best pizzas I've ever had in London. The 40 seconds that it takes to make the pizza does mean that you're in and out quite quickly, and the fact that it's not open evenings is nothing short but distressing when you get the craving for one of their pizzas in the evening - but on food alone, it's wonderful. For fabulous pizza at recession-busting prices, slide on down to Brixton Market and feast on some of London’s finest organic Neapolitan fare. This open-air pizza parlour sits among the rush and bustle of Market Row, moments from Electric Avenue, in the wild heart of Brixton. Franco Manca is open from 12pm to 5pm Monday till Saturday and boy, does it make its money in those hours. A handful of mix and match tables are eternally filled from open till close. The decor is as basic as it comes from old marble knock-offs a la Pizza Express to wooden pews and well-scrubbed benches. Dominating the open kitchen is a large egg-shaped wood-fired oven imported from Naples which cooks the legendary pizzas in under two minutes. Franco Manca has all the appeal of a Neapolitan pizza parlour despite its unlikely location. Queuing is almost essential although thanks to the speediness of the service, this is usually limited to 10 to 15 minutes at the most. Locals dine to a chorus of fishmongers, butchers and squawking stall holders which all adds to the lively atmosphere. The clientele is generally a loyal bunch, who have taken the restaurant into their hearts. Possibly the most surprising thing about this friendly little place is, not only are the pizza’s made from the fabulous slow-rising sour dough that makes Neapolitan pizzas so perfect, but the entire menu (drinks and all) is made from organic and if possible, locally-sourced produce, therefore making it completely guilt-free. The menu is limited to six choices from the popular No. 1 with tomato, mozzarella and basil, to the seasonal No. 3, with wild mushroom, garlic and anchovy. Prices are exceptional value from £3.90 for a No. 6 (tomato, garlic and oregano) to the wholly reasonable £5.60 for No. 5 (a tomato, mozzarella and cured organic chorizo - from Brindisa no less). The No. 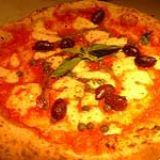 4 with garlic, oregano, capers, olives, anchovy and mozzarella is your quintessential Neapolitan pizza, the slow-leavened base is light and crisp and scattered with the biting tang of capers, anchovy and green olives and dotted with creamy fresh mozzarella. The only other thing on the menu is a bowl of organic salad (£1.50), a basic affair made with fresh leaves, fennel and radish with a light lemony dressing. The drinks list is easily summed up as Short and Sweet and a bargain to boot. A bottle of organic Italian red wine is £6.50 (yep, £6.50!) the beer is a blonde lager from Hepworth & Co. in Sussex and is also organic. The homemade lemonade (£1) is a deep yellow, sweet and still version served in recyclable glass bottles. Post-pizza there is organic espresso (£1) from the Monmouth Coffee Company. 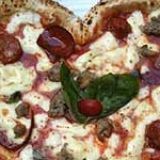 Not only is the pizza great, the atmosphere fun and the oh-so cheap prices irresistible but Franco Manca is one of the real highlights of organic dining in London.